Punta José Ignacio is a cape in the Atlantic ocean just Northeastward of Punta del Este. There is a SPM (Single Point Mooring) buoy, named Terminal del Este, which belongs to ANCAP (State Oil Company) positioned at Lat 34º 53´05´´S and Long 54º 42´07´´W, 2 nautical miles off-shore, in a depth of 18,60 m.
Tankers up to 150.000 DWT can be discharged, and, under favorable conditions, vessels of up to 200.000 DWT can be handled. 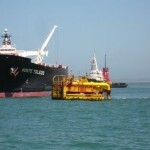 The average rate of discharge is 7000 cbm/h with 2 floating hoses to one submarine 35´´ pipeline. The shore terminal, storage capacity 536.000 cbm, receives, stores and pumps the crude oil to the refinery at Montevideo. On arrival, tankers must anchor at the roads, Lat 34º 57´30´´S Long 54º 40´00´´W at least 900 meters off the buoy. The vessel waits here for the boarding commission, consisting of the Health, Coastguard, and Immigration authorities, the SPMB´s Berthing Master, Pilot, Ship´s Agent, ANCAP´s representative, two launches for hose connections and the mooring gang. Vessels arriving before 13:00 hours LT (1st April-31st October) or 15:00 hours LT (1st November-31st March) are made fast to the buoy on arrival but vessels arriving after these times are obliged to wait at anchor until the next daylight. In bad weather when the commission cannot go out, vessels should proceed to an anchorage about 3 miles off within the area enclosed by Lats 34º 59´00´´ and 35º01´00´´S and Longs 54º 47´36´´ and 54º 50´00´´W. 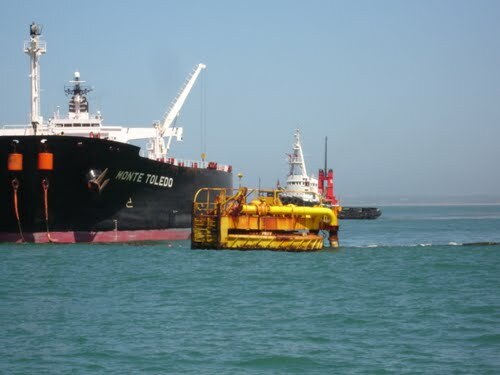 On arriving vessel must advise its ETA to Traffic Control Center of Punta del Este and ANCAP, Montevideo, not less than 48 hours in advance, with confirmation 24 and 12 hours before arrival. The message together with full details of the ship and cargo can be sent by wireless or VHF (refer section “Traffic control System”). The usual safety rules for such an operation must be strictly observed. The pilot remains on board until the vessel sails. Ship´s Agents should be given early advice of arrival, preferably 5 days notice, to enable them to make all arrangements.